Well, friends, the destruction of The Scottie House continues. Prior to our big move, the only thing Heather ever chewed was treats (okay, and the occasional spilled remnants from a trash can she knocked over). Now, it appears she has taken a liking to chomping on the window sills. I'm not sure what gives. 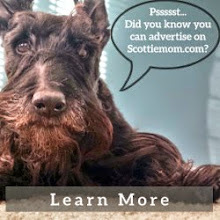 Do Scotties develop new habits over time? Additionally, it appears that Heather Houdini is a mastermind at figuring out this Scottie Mom's work arounds to keep her out of things. Two days ago, she figured out how to break into the master suite again and she ransacked a Vera Bradley bag full of stuff we had yet to unpack. She took two small (empty) jewelry boxes given to me by my great aunt and gnawed right through them. When I got home, they were open and scattered across the floor in pieces. Mr. K apparently got so nervous his big sister was breaking the rules that he pooped his pants right there in the master bedroom...What a lovely homecoming it was, let me tell you! Honestly, I'm hardly upset with Heather or Mr. K at all - just grateful there wasn't anything inside they could have swallowed and hurt themselves with. I'm thinking of buying a child proof lock or something for that master suite door. But just because it is child proof makes me think it may not be Scottie proof with the things Heather has been able to figure out. (I swear she outsmarts me, sometimes!) And as for the window sill issue, I'm not entirely sure what to do. We've moved the Scottie beds from the windows and that seems to have taken care of the issue for now. Only time will tell whether these tail wagging tales of destruction will continue (paws crossed they don't!). The move has probably raised some separation anxiety issues. I love to eat books. If I run out of books, I might try window sills but we don't have them in our house so I'll find something else. The first time They left me alone, I pulled the thingy out that was in the wall that prevents the door from hitting the wall. It came right out of the baseboard. I was the only one home and I couldn't blame it on anyone else. Not bad for being alone for 30 minutes. That's a guilty look if I ever saw one. I suspect they'll settle in over time. Change make us all a little nervous. O...M...D, we think we'd have pooped our pants too! Our chow/shar pei clawed thru the dryer vent hole and make a huge mess...and that was AFTER he had messed up the front door and window sill-I agree with Bari, sounds like sep issues. Ah, gotta love the little 'people' in our lives...they sure make it more interesting! Mr. Winston just goes in my craft room and leaves 'presents' for me to find...he makes SURE Momma knows when HE is not happy! Our Scotties stay in wire crates when we are not home. When we go to work, but we come home for lunch to let them out. They are happy in the crates they have lots of room. They feel safe in the crates. New moves are very hard on some dogs. uh-oh! Not a good start to this new chapter in your lives is it? Mama said there's some good suggestions given 'bout crating and stuff. 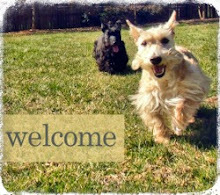 Keeps us scotties safe from mischievous destruction, guilty looks and pooping ourselves. Hope they grow out of it soon! Oh dear - little scottie must be anxious with all the change. Maybe a nice bone to chew on instead? My Granny always used lemon juice to prevent the chewing on furnitures, people and clothes. 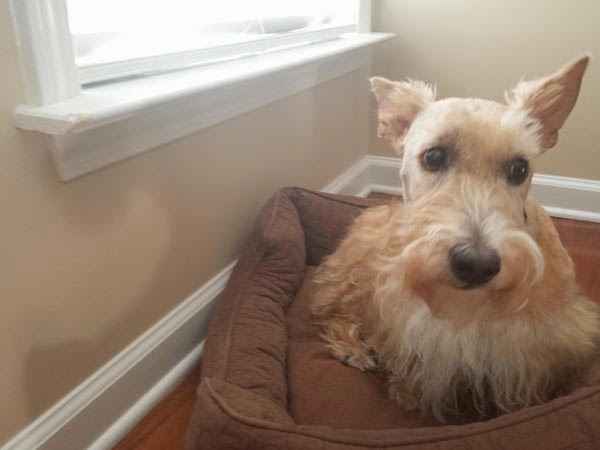 But it was only helpful for a short time, then their Terrier was the "Terrierist" again. 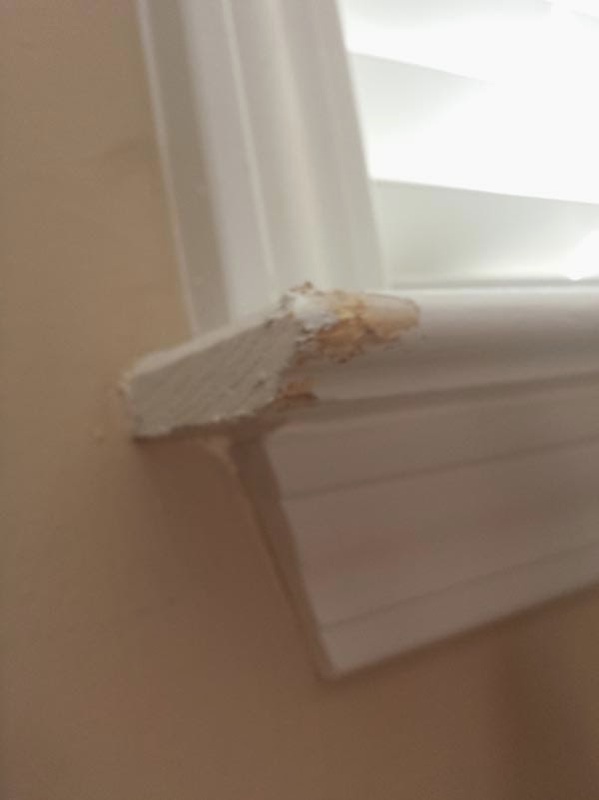 Our Scottie was a great chewer of skirting boards. His dad mixed up a water and chilli mix and applied liberally and we haven't had any more destruction ( of that sort anyway) since! Try leaving the radio or CD player on while you are away, but crating is really good.